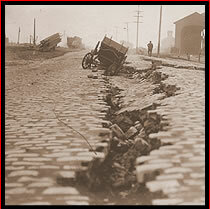 The 1906 San Francisco Earthquake and Fire Digital Collection includes nearly 14,000 images and 7000 pages of text. Keyword(s) are searched in the image descriptions or in the full text of the documents. Case Sensitive: Searching is NOT case sensitive. Example: "Earthquake" or "earthquake" will yield the same results. Exact Phrase: Use quotes to search for an exact phrase. Example: "streetcar" will find streetcar, but not streetcars. Plurals and Singulars: Searching the singular form of a word will also retrieve the plural form, and vice versa. Example: tent will retrieve tent and tents; tents will retrieve tent and tents. Truncation: The wild card is "*"
Example: photo* will retrieve Photographs, Photograph albums, photomechanical prints, etc.